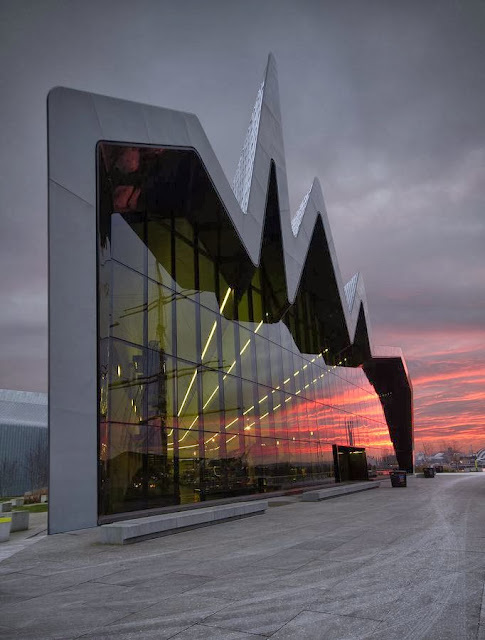 The Riverside Museum building was designed by Zaha Hadid Architects and engineers Buro Happold. The internal exhibitions and displays were designed by Event Communications. Replacing facilities at the city's Kelvin Hall, the new purpose-built museum is the first to be opened in the city since the St Mungo Museum of Religious Life and Art in 1993 and is expected to attract up to 1 million visitors a year. Although containing approximately the same floorspace as the previous museum facility at 7,500 sq m, it creates a more environmentally stable home for Glasgow's significant Transport Technology collections. The building also houses a workshop and office space for the Clyde Maritime Trust. The location of the museum is on the site of the former A. & J. Inglis Shipyard within Glasgow Harbour, on the north bank of the River Clyde and adjacent to its confluence point with the River Kelvin. This site enables the Clyde Maritime Trust's SV Glenlee and other visiting craft to berth alongside the museum.